Click on me or my grandson, Jay, or anywhere else in the picture to see our original October 2013 post. Of all things that could enter your mind as having been manufactured in LA (lower Arkansas), steam locomotives would probably wallow at the bottom of your list. That guess would be wrong. The former Cotton Belt Route railroad built a lot of steam locomotives here. Among the last ones built were ten “800”series 4-8-4 steam locomotives in the early forties. Ten kissing cousin locomotives were built about the same time in the Baldwin Locomotive Works in Eddystone, Pennsylvania. Of those twenty iron horses just one still survives – and it lives in the Arkansas Railroad Museum here in Pine Bluff, Arkansas. You can see and touch it there. Click on the monster machine above to see more railroad museum pictures. In October of 2013, my grandson and I visited the museum and drooled over the locomotive along with a few of the hundreds of other railroad artifacts in the museum. These objects run the gamut from a single railroad spike to a some additional locomotives.The museum is a treasure trove of railroad history. This week, we are sending you back to our report of that trip. Click here to see our original October 23, 2015 story and pictures. To see more of the same story and other railroad pictures go to the Corndancer Photo of the Week page and dig-in. Four of a kind, more or less. 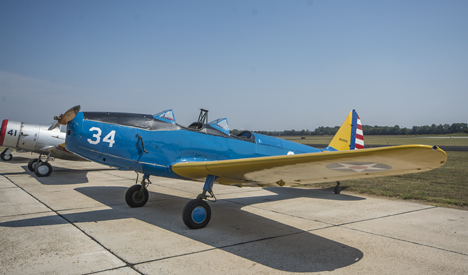 From right Stearman trainer, Ryan PT-19, Vultee BT-13 and a North American AT-6, all on display at the 2015 Annual Razorback Chapter of the Experimental Aircraft Association on Grider Field at the Pine Bluff Regional Airport. All of these old birds fly. Some more than others. It’s always fun to attend an airshow where you can not only see, but also walk around the old WWII era birds and play touchy-feely. This is also the one time that non-aviation folks are allowed to come and go as they please off and on the normally hallowed and verboten grounds of an airport. Click on the cockpit to see more Air Cam II pictures and read the story. Air shows also attract unusual aircraft, and this one was no different. Pilot and aircraft enthusiast Presley Melton of North Little Rock AR flew in his Lockwood Air Cam II plane. 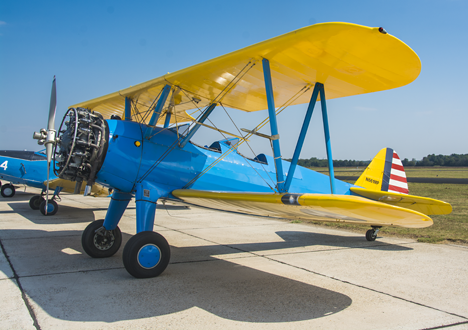 The forerunner of this aircraft was made famous during as it plied the skies of Africa during a long aerial photography shoot for National Graphic. See pictures and read more about this amazing bird on the Photo of the Week page at Corndancer dot.com. We’ll wait here while you look. 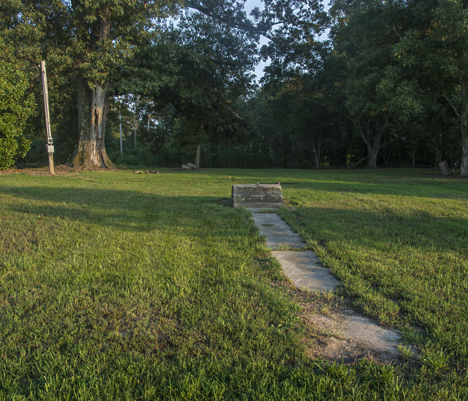 During WWII, Grider Field, now Pine Bluff Regional Airport was home to a US Army Air Corps basic pilot training school. 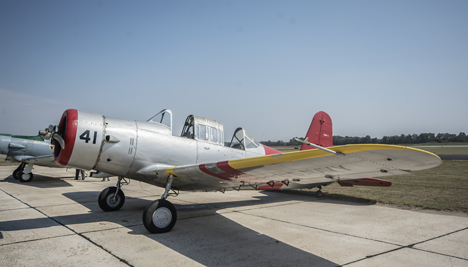 The primary aircraft used to train these pilots was a Ryan Navion, AKA PT-19. 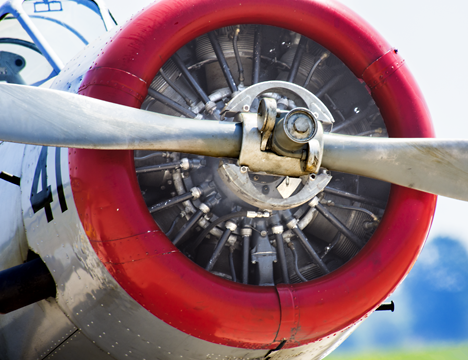 More than 70 years ago, dozens of aircraft just like this gave fledgling pilots their first experience at the controls of a flying airplane. Notice the crank between the aircraft number and wing. That’s how one starts the engine on this bird. Can you spell knuckle-buster? This is the Vultee BT-13, another WWII trainer. It flies regularly. I have been a passenger in this aircraft doing an aerial photography shoot. See the story about that experience here. While I was at it, I shot a picture of how it looks as a passenger in the rear seat of the aircraft. Click here and see what I saw. 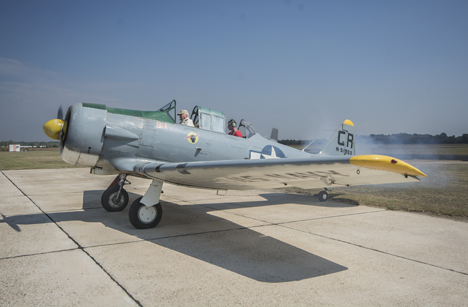 This North American AT-6 is belching the smoke and clatter of its mighty radial engine cranking up. Pilot Clarence Rittelmyer is about to take off as he gives a friend a ride. Heeeeeeeeere’s Clarence. Clarence Rittelmyer at the controls of his AR-6. 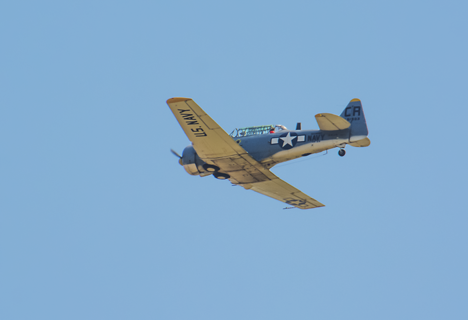 And here’s Clarence and the AT-6 from the ground as it roars by skyward. 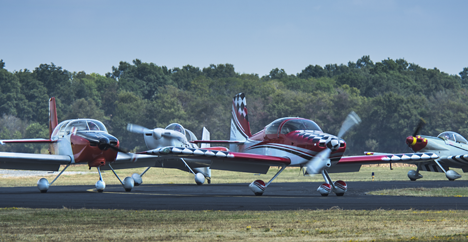 The show always features formation flying and/or aerobatics. 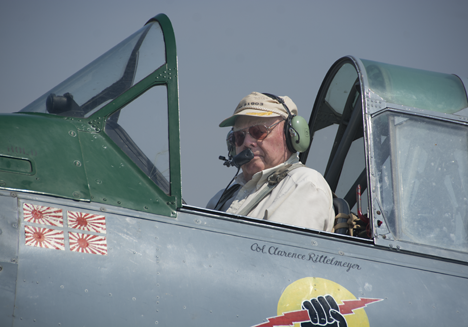 Gerald Lloyd and Bulldog Formation Flights did the honors this year with a fine display of precision flying. Unfortunately, the haze in the area and distance from the camera prevented me from recording any decent pictures, so you’ll have to be satisfied with a few of the birds as they landed. 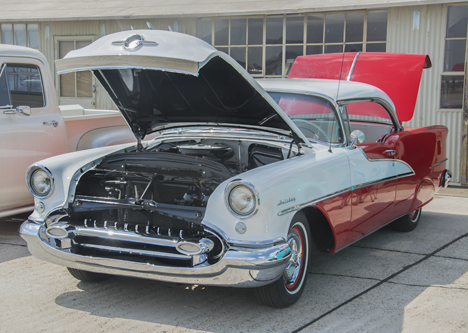 A 1955 Oldsmobile Holiday Coupe. These cars had big engines and out on Highway 67 between El Dorado and Calion AR back in the day, they ruled the roost in a quarter mile. Ud’n, ud’n! Ibadee, ibadee, ibadee, that’s all folks. No mind challenging observations. Just gool ol’ fun. Click on the cow to see our original October 2013 post. I recently discovered that the first leg of my favorite levee trip, starting east of Moscow, Arkansas is now no longer available. The last time I topped the levee a few weeks ago and prepared to turn southeast I saw a locked gate barring my entrance. I was bitterly disappointed since the now-barred section is the first leg of my favorite run of the levees for the last 25 years or so. The disappointment brought to mind my levee run of October 2013 when I was fortunate enough to be accompanied by my granddaughter, Madison Dempsey. It was a bit longer than usual. We left the levee at Arkansas City, Arkansas. Along the way, we paid a visit to the banks of Big Muddy, the mighty Mississippi River. Since that trip in its entirety is now not possible, we are revisiting the said former excursion this week. Click on the cow to see our original October 2013 post. Click here to see our original Corndancer Photo of the Week story on the trip. This trip is a good reminder that those things put off may never come to fruition. 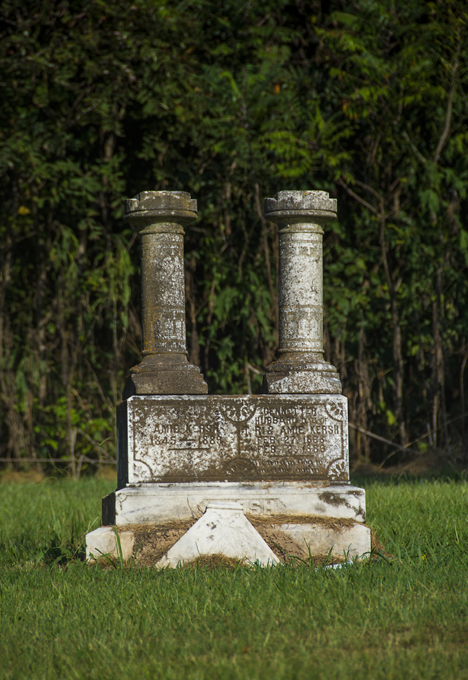 Beneath this disassembled headstone west of Varner, Arkansas lie three members of the Kersh family, interred in 1868, 1886, and 1889. The capital that originally went across the columns lies in front of the marker. There are a few other graves in this cemetery. For reasons unknown the cemetery apparently fell in disfavor with those looking for a final resting place back in the day. This is not my first time to shoot here and it is always well taken care of. 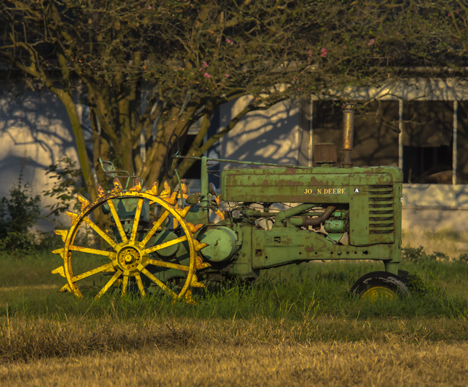 Click on the combine to see the first part of this story – crops on parade, so-to-speak. The words of the immortal and well-admired Fats Waller, “One never knows do one?” pretty well summarizes what you find on a random swing through the Delta. 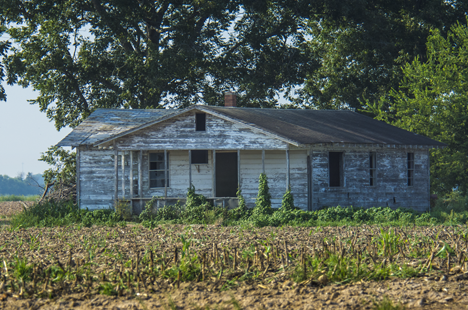 Recently I made such a trip to record early seasonal change harbingers in the agriculture neighborhoods of LA (lower Arkansas). I found what I was looking for which you can see on the Photo of the Week page at Corndancer dot-com. Take a look and we’ll wait here for your return. What you see here, is the other stuff that always shows up and makes life interesting. The trip, for local information, was entirely in the confines of northern Lincoln County. The pictures are in order of shooting. A bit down the gravel road from the cemetery I found this abandoned farm house. 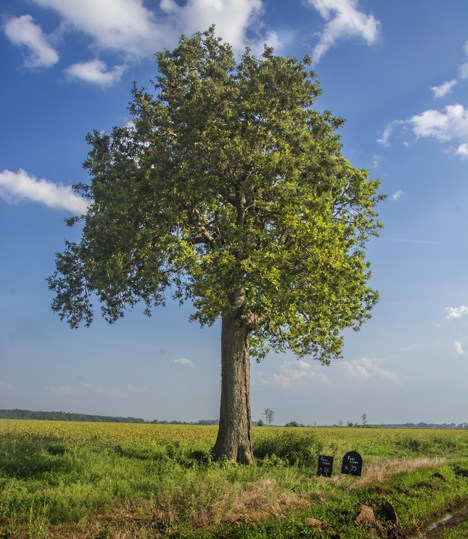 The site is complete with a large “home-place tree,” universally found on abandoned residential plots in the Delta. In most cases, the trees well outlast the residences. A case in point. This is no doubt a “home-place tree” which has outlasted the residence for which it provided shade and comfort. After a spate of “nothing-out-of-the-ordinary” countryside, I rounded a curve and found a pond with some mallard hens and white goose. 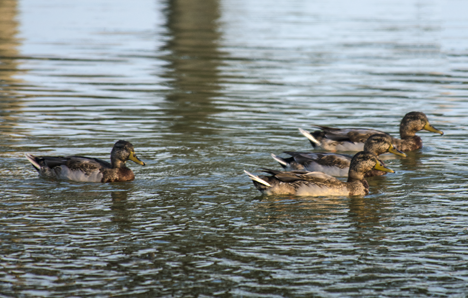 Ducks in southeast Arkansas inherently distrust good-ol’-boys in a pickup so this fleeting shot was all I could get before they completely showed me their tail feathers. 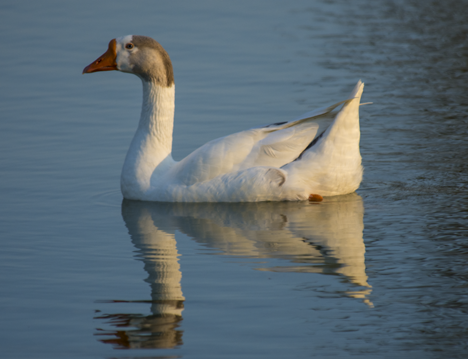 The goose was a tad more cooperative, but not overly so. I found this John Deere A model tractor sitting at an unoccupied farm house. The late afternoon sun turbo-boosts the warm colors. 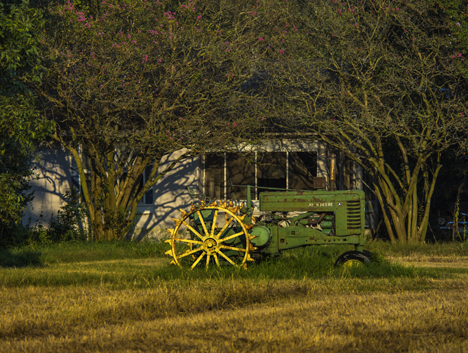 I’m almost certain that when the tractor was parked that positioning it to be framed by the crepe myrtle trees was not intentional. Nevertheless the arrangement is very way cool. What used to be — chances are that a residence was here and burned. Someone thinks enough of the former home to take care of the site, a good thing, since it reminds us to treasure those things of true value. After this, it was time to repair to the intergalactic headquarters of the Dempsey empire for supper and picture processing. To my delight, I found a chocolate cake freshly prepared by my spousal unit. I hope you enjoyed this outing as much as I did finding all this stuff — and hope there’s a chocolate cake in your near future.